Last week I was scouting some new property that I had just gotten permission to hunt when I stumbled upon one of those spots that just screams “BIG BUCK HONEY-HOLE!”. I didn’t need to stomp up the place looking for sign, I immediately knew this place had the “it” factor. I quickly found a place on the edge of the good stuff and put up a trail camera and slipped away with plans to return soon with a tree stand. With rain forecast for this afternoon, I went in this morning and hung a stand in a tree I had selected on my previous visit. In about 20 minutes I had my stand in place in a perfectly situated pin oak. As I sat there in the stand noting shooting lanes and such I didn’t want to leave. I almost wished I had my bow and gear along and could have just strapped in and stayed through November. I am THAT confident in this stand location. I have heard a lot of talk over the years of deer having a sixth sense for avoiding danger. Well I am here to tell you that some deer hunters have a sixth sense for locating and killing mature bucks. I am not sure how common it is. Maybe every deer hunter that tags giant bucks on a regular basis has it? I don’t know for sure but I do know that I have had it for a while now. When I see the magic spot I know it and yet I cant say exactly what it is that makes me recognize it as such. I can be driving down the road in unfamiliar territory and something will catch my eye. If my wife is along I will often say “That looks like a good place to kill a giant buck”, to which she will just roll her eyes and nod her head as if to verify that all I ever think about is big bucks. I feel good about every stand I hang; if I didn’t, I wouldn’t put a stand there. In fact I will take it a step further and say that I honestly think that I could kill a mature buck from every stand I hang. Most of the time that won’t happen but it certainly could. The funny thing about the stand I hung this morning is that I almost overlooked that spot just like every other deer hunter in that area. I came so close to just going past it without giving it a closer look. Once I did however it didn’t take long for the light to go off in my head … BINGO! It doesn’t happen often enough that I get this special feeling about a stand location but when it does I get fired up. One great thing about this spot is that I don’t fear another hunter jumping my claim. Almost nobody will notice it for what it is. What is it? It is the perfect combination of ideal cover, terrain features and near perfect access that can be hunted with a very common wind direction. Honestly, the situation is impossible for me to describe in such a way that someone could go out and look for a similar spot within their hunting grounds. I probably won’t see a lot of deer from this stand as it is in some thick nasty cover. Any deer I see will be close, likely within 20 yards. What gets me excited is that I absolutely know that there WILL be a mature buck walk past that stand in daylight hours this season. The big question is, will I be there when it happens? 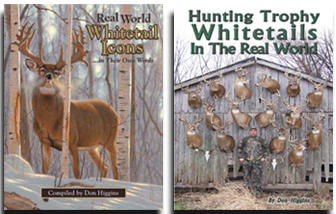 Don Higgins’ 2 books on hunting trophy whitetails can be ordered on this website.